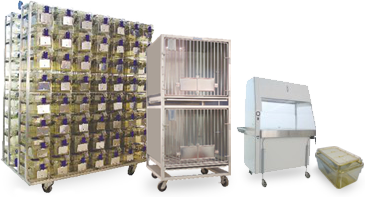 At LABEX of MA we bring together a unique combination of industry experience and unmatched inventory to make us your best choice for used, reconditioned and refurbished animal caging and vivarium equipment. We are uniquely qualified to understand the needs and requirements of university, research, pharmaceutical and biotechnology customers and we are confident you will be satisfied with our products and customer service. LABEX of MA Provides a Variety of Used Animal Caging including dog, cat, rat, mouse, rabbit, guinea pig, and monkey (nhp). "We have purchased items from LABEX for years. We have never been disappointed in the hands on customer service or the quality of merchandise we have received from them. Most recently we had a time sensitive shipment that had to be meet and LABEX came through for us. I want to thank all that make it happen there!" Stop by and visit us at any of these meetings! We would love it!